The caring team at Friends & Family Spinal Care will welcome you to our clinic and help guide you along your journey to wellness. Reach out to us today to get started! Hablamos español. Was born in Bronx, New York and moved to Florida at the age of 9.Growing up she was always passionate about health and fitness, it all started with dance. She started dancing ballet at age 2 and stopped at age 20 when her medical career began. She has been in the medical field for over 15 years and in management for 10 years; maintaining a high degree of organization in fast –paced environment. Josephine has always had a passion for helping people, and developed an interest in learning natural approaches to healthcare when her mom was diagnosed with Multiple Sclerosis. 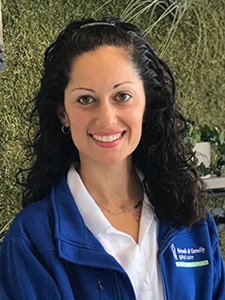 She enjoys spending family time doing mostly outdoor activities like pool- time, beach, and watching her boys on both the soccer and baseball field, so it is very important to her to remain healthy and clear of interference so she can keep up with her two sons and all their activities. Since she joined Friends & Family Spinal Care, NUCCA has helped her with her back pain, headaches and overall Immunity.